Import of waste to Slovenia has been rather stable in recent years, mainly provided for the needs of a recovery facility processing waste lead accumulators. In 2007, about 27 thousand tonnes of waste were imported. Export has been rapidly increasing in recent years, nearly fourfold since 2004. In 2007, about 70 thousand tonnes of waste were exported, mainly to Austria and Germany. The indicator shows the annual quantity of waste exported from and imported to Slovenia, which may be either hazardous or non-hazardous and for which approval must be obtained. Transboundary shipping of waste is governed by the Basle Convention on the Control of Transboundary Movements of Hazardous Wastes and their Disposal (Official Gazette of the Republic of Slovenia - International Agreements, No. 15/93, 2/00 and 23/04), and Regulation (EC) No. 1013/06 on shipments of waste (OJ L, No. 190/06). The Regulation is implementing the Basle Convention, the OECD Council Decision on the control of transboundary movements of wastes, and the results of the Lomé Conference. Import of waste to Slovenia for the purpose of depositing into or onto land is prohibited. It is only allowed if such waste will be safely disposed of in some other manner or recovered, and if sufficient technical capacities are available. Export of waste from Slovenia for disposal purposes is only allowed, if sufficient technical capacities and facilities required for harmless disposal are not available in the territory of the Republic of Slovenia or if such export is not in conflict with the provisions of Regulation (EC) No. 1013/06. To ensure own recovery capacities and capacities for disposal – the principle of self-sufficiency; to properly monitor the shipping of waste, including the certificate on final recovery or disposal of waste; and particularly to ensure a high level of environment protection and protection of human health (to limit the transboundary shipments of waste to the minimal level that still enables environmentally sound waste management); to ensure that waste is recovered and disposed of as close as possible to their place of origin; to limit the generation of hazardous waste (in terms of quantity as well as the level of hazardousness); the state must ensure self-sufficiency in waste management, recovery and disposal of waste as close as possible to their place of origin, with recovery prevailing over disposal. The State is further obliged to provide for environmentally safe waste management and to prevent illegal shipments of waste. To ensure final disposal and recovery of hazardous waste, and to use the infrastructure within the EU when national facilities are not sufficient or non-existent. In recent years, the quantities of imported waste have slightly fluctuated between 20,000 and 27,000 tonnes per year. Since the majority of imported waste is processed by one recoverer, the quantity of imported waste depends on the quantity of waste collected within Slovenia. In 2007 waste lead accumulators, their parts and lead ash for recovery in MPI-Reciklaža d. o. o. were imported from Hungary, Croatia, and Bosnia and Herzegovina, and party also from Macedonia, Germany and Italy. In the past years, several acidic and alkaline solutions were imported in order to be recovered in Cinkarna Celje. In 2007 Slovenia mainly exported sludge from urban waste water treatment plants (31%) and mixed waste in which at least one type of waste was designated as hazardous (24%). Exports also consisted of solid waste from waste gas treatment (9%), washing liquids and mother liquors (6 %), biodegradable kitchen waste (6%) and other waste. They were disposed of or recovered in Austria (42%), Germany (37%) and Hungary (19%), and some in Poland, France and Romania. Export of waste has been increasing in recent years. In 2007, it was more than doubled compared to the previous year. Such increase is the result of larger volume of sludge from urban wastewater treatment plants and of mixed waste in which at least one type of waste was designated as hazardous. The latter was not exported in previous years. In 2005, the export of sludge from urban waste water treatment plants amounted to approximately 1,730 tonnes (7% of the total quantity), in 2006 to approximately 14,200 ton (36% of the total quantity), and in 2007 already to approximately 21,600 tonnes (31% of the total quantity). According to a study carried out by the European Topic Centre on Waste and Material Flow, transboundary shipments of waste crossing the EU Member States borders has heavily increased in the last decade. This increase is a result of transporting hazardous and non-hazardous waste, as well as illegal shipments. 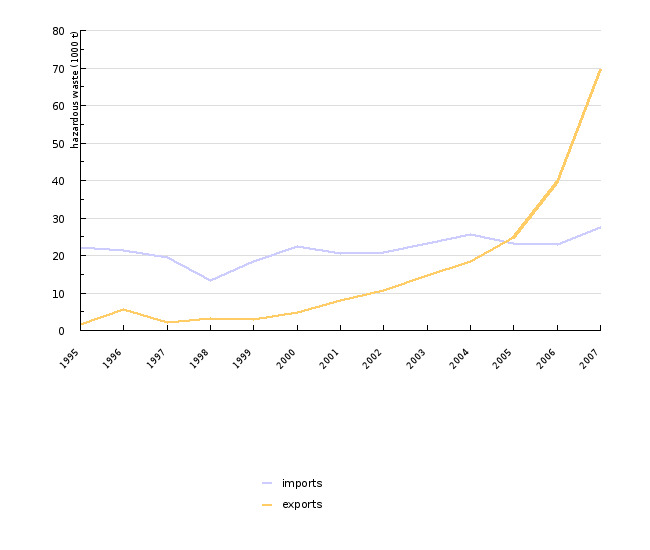 In the period from 1997 to 2005, both legal export and import marked a nearly fourfold increase. 80 % of waste was exported for recovery. Transboundary shipments of hazardous and problematic waste is mainly resulting from price differences for recovery and disposal of waste, insufficient domestic capacities for recovery of waste and the need for special processing technologies. In general, bigger countries have more diverse and technologically sophisticated facilities for recovery and disposal of waste. Also increasing are transboundary shipments waste paper, cardboard, plastics and metal. Partly due to higher legal requirements for the recovery of waste, and partly because of the Asian market which is competitive primarily because of low shipment costs. The ships bringing goods from these countries offer very attractive prices on their way back.